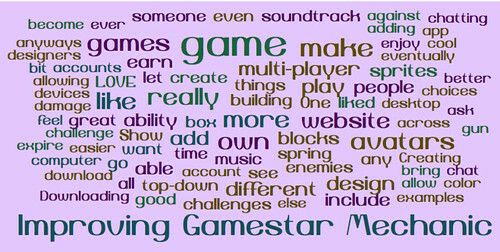 My students love using Gamestar Mechanic to learn video game design. But they also expressed questions about features and abilities that do not exist in the site. So, I figured, why not give them an opportunity to express those wishes for improvements to the Gamestar Mechanic folks directly? I was thankful when I got a response from Gamestar folks, asking me to send along the student reflections and advice. There’s nothing like a real, authentic audience to spur some solid thinking out of my students. Our sixth grade classes have been immersed in video game development for the past three weeks, working on learning how to design and publish games via Gamestar Mechanic as they work on a science-based video game project. Your site has been incredibly useful to us as we learn about games while playing games. As we neared the end of the project, we wanted to offer you, the developers, some feedback from us, the users. As part of a survey, we were given the chance to offer up some suggestions. We’re including some of the writing as well as some of the themes that came through in our writing, in hopes it might help you think about Gamestar Mechanic and consider possibilities. We connected this writing to you with our own efforts to gather feedback from users on our games in order to make them better. Perhaps our feedback might be valuable to you. We hope you find our reflections useful. Or, as one student wrote in capital letters: GET YOUR GAME ON! Wondering about an app version for mobile devices? I really liked building and playing games, and that was really different for me, since I don’t usually play any video games. One thing I didn’t like is how design options are limited: you can do a platform or top-down game. To make this more interesting, I would like to be able to design my own avatars, enemies and blocks as much as possible. Also if I was able to download my own music for the soundtrack that would be really cool. But overall I really liked your website! I think Gamestar Mechanic needs to let kids not pay to become premium member. They should add new characters. They should make all challenges not to expire at all because I didn’t have an account in spring and I wanted to do the spring challenge and it expired. I think Gamestar Mechanic was a great experience. I wish that the game design could be 3D. I thought it was great. To improve Gamestar Mechanic, I would make an icon or box on the website to show the gamers how you can earn more avatars, like how to earn the text box or the shooter gun. Show them what challenges to do to earn more things in your workshop. I LOVE Gamestar Mechanic how it is now anyways. I really like this website and I normally hate any computer games. The only suggestion I have is to allow multiplayer games and allowing multiple people to make one game. That’s really it I love this website keep up the good work!!! I feel you should include multi-player like the option to make your game multi-player so that when you publish it then you can go on at the same time as someone and then play against them like see who can do it the fastest. Also, you should include chatting so that if you’re on at the time as someone else and you have multi-player, then you could ask them if they want to play a game with you. That’s what I think you should include in Gamestar. I enjoy the website as it is but, I think that it would be nice to be able to add our own sounds into our games. It would bring more life to the game and it may be easier for people to see the story of the game. A good idea would by adding custom sprites for people to make the game a little different from others and maybe eventually, you might want to add a 3-D aspect to the games. What I think is that they should let you design your own sprites, ride animals, and go on completely different quests. I think that you can make this site even better by making things a tiny bit more realistic. Some examples are the backgrounds and the avatars. There should be a bigger variety of blocks, enemies, and avatars.